Get the cheat sheets for this article in high-quality PDF + other free resources for photographers. When you learn photography, there comes a time when you want to move past the auto mode. Switching to shooting in manual mode can be a daunting experience, though. 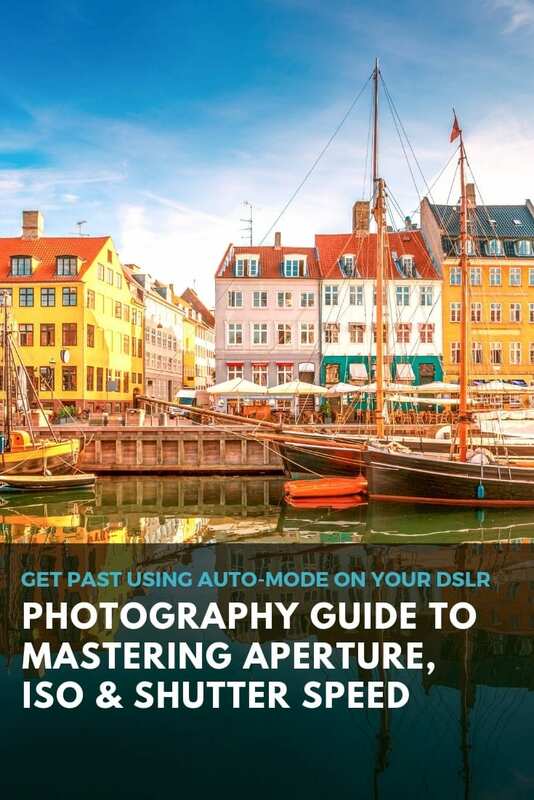 However, mastering manual mode will improve your photography skills significantly. 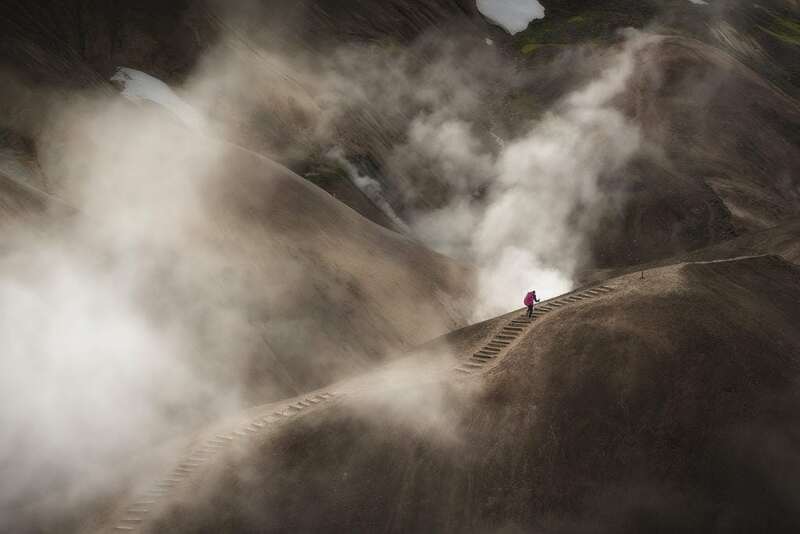 Jump out of your comfort zone, knowing that leveling up will give you a better understanding of photography and enable you to create better photos. 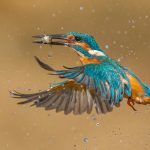 To master manual mode, you need to understand exposure and the three fundamental factors of aperture, shutter speed, and ISO. Combined correctly will give your images perfect exposure in camera. Even though you don’t want to shoot in manual, understanding these three essential factors in photography will let you have more control of your photos. In this guide, you will learn how to use aperture, shutter speed, and ISO to create perfectly exposed photos. Light changes during of a day, from dark to bright and turns back to darkness again. The changes to a scene can be dramatic and amazing to behold with our eyes. Your camera’s job is to capture the available light that enters through the lens and let it ‘hit’ the camera sensor. Your camera interprets the light reaching the sensor create a digital image file from it. The amount of light that your camera can ‘catch’, changes when the light outside does and this will make the photo darker or brighter accordingly. If you have too little light entering the camera, the photo will become underexposed. If too much light enters the camera, your photo will become overexposed. With the correct amount of light entering the camera, you will get a perfectly exposed photo, with nothing totally hidden in the shadows and without blown out highlights. Since the amount of light changes during the day, your camera also has to have a way to understand the light and adjust to it. Your camera does this primarily by balancing three basic factors, which is the shutter speed, the aperture, and the ISO. Shutter speed, aperture, and ISO are the three basic pillars of understanding exposure. Exposure Level Indicator on the LCD screen on the back of a Nikon DSLR. In manual mode, your camera helps you evaluate how much light is needed to get a perfectly exposed scene. 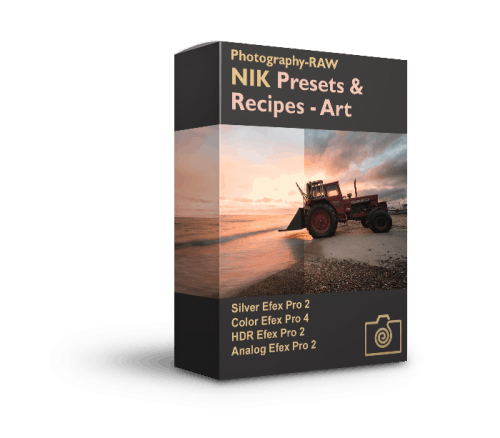 It tells you what the current setting would result in with the exposure level indicator that you see in the viewfinder or on the LCD screen on the back of your camera. The exposure level indicator should be centered to get a perfect exposure. If the indicator is showing negative values, your image will become underexposed and therefore dark. If the indicator shows positive values, your image will become overexposed and too bright with washed out colors. To get a perfectly exposed photo, you should adjust one of the three exposure factors: Shutter speed, aperture or ISO (or several of them). Shutter speed, aperture, and ISO all affect the exposure of a photo. And they do so in relationship to each other. If you change one of them, then you will see the exposure level indicator in the viewfinder/LCD moves accordingly. This means that if you change one of them, you have to change at least one of the other to get the same exposure value as before the modification. Let us say you are taking photos of your kids in the garden and your camera tells you with the exposure level indicator that the exposure it perfect. However, if the kids are running and jumping around all the time, the photo might look blurry and unsharp because they move so much. To avoid this, you can increase the shutter speed which will make your kids appear sharp on the photo. However, when you increase the shutter speed the exposure level indicator moves into the negative values telling you that you don’t get enough light for a perfect exposure. To remedy this, you would have to sacrifice either the current ISO value or your aperture value. Changing these comes at a cost of either more grainy look as you raise the ISO or a shallower area in focus as you use a larger aperture. The key point in balancing your settings is a puzzle game of gain/loss that you have to solve for each photo. However, it isn’t as difficult as it might sound. I know it can be a bit tough to grasp how the exposure triangle works. 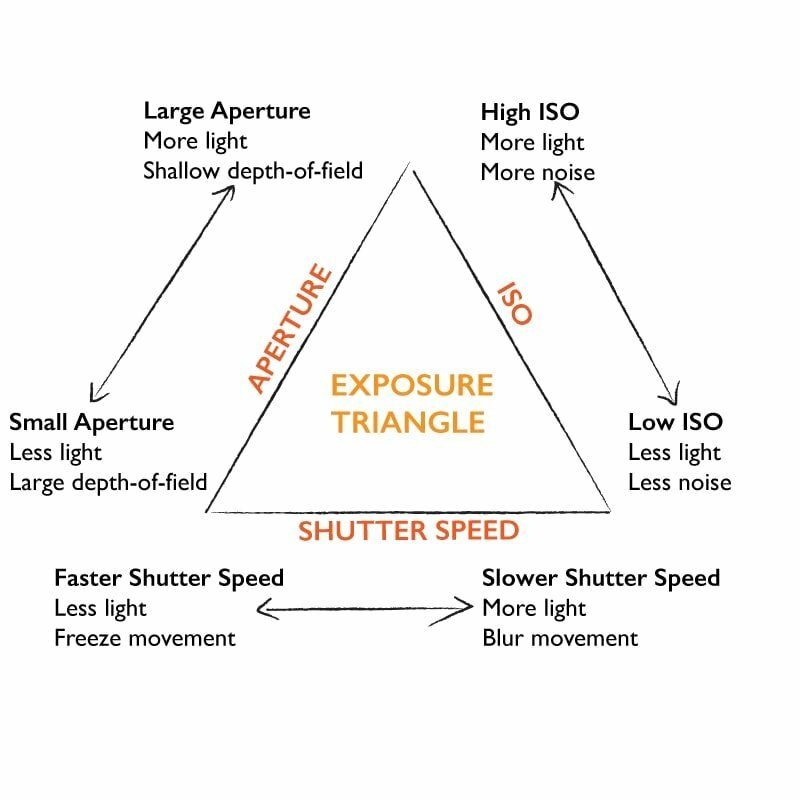 Over at Photographytalk.com, they have made a very useful post that explains the exposure triangle in plain English, if you want to know more about it. The easiest way to understand aperture is by likening it to the pupil in a human eye. The pupil adjusts to control how much light passes further into the eye. If you enter a dark room, the pupil will expand to allow more light to enter. If you point a flashlight towards your eye or go outside into the sun, the pupil will contract to allow less light to pass further into the eye. Aperture has the same function in a camera lens. It controls how much light enters further into the camera. However, our eyes are dynamic and adjust to light so fast that we don’t even recognize it. Your camera is limited to use only one aperture setting per exposure. Furthermore, unlike the pupil in a human eye, aperture also changes the camera’s ability to focus over a wide distance, which is called depth-of-field. You can see this a limitation, but also as a creative constraint to control which areas of your image you want to have in focus. Aperture is measured using the F-stop scale. On your camera, you will see this displayed as i.e. F8 or f/8. The f-stop ranges that a lens can control usually varies from f/2.8 to f/22. However, some fast lenses can handle f-stops up to f/1.4. In the beginning, many get a little confused about aperture values. This comes from a large aperture (hole) has the value of f/2 while a small aperture has the value of i.e. f/22. This seems contradictory. However, if you think of it as fractions, like in 1/2, you can clearly see that this is bigger than 1/22. It is quite normal, at the beginning, when someone asks you to use a small aperture, to instinctively turn the dial f/2, which is a large aperture because the lower number tricks you. Below you can see how the aperture works. At f/1.4 the aperture is wide open and lets in plenty of light. However, at f/1.4 the depth-of-field is very narrow, which means that the background will get blurred and create a beautiful bokeh effect. The potential downside is that the depth-of-field can become too narrow for you to keep your whole subject sharp. In that case, you should use a smaller aperture to increase the depth-of-field. 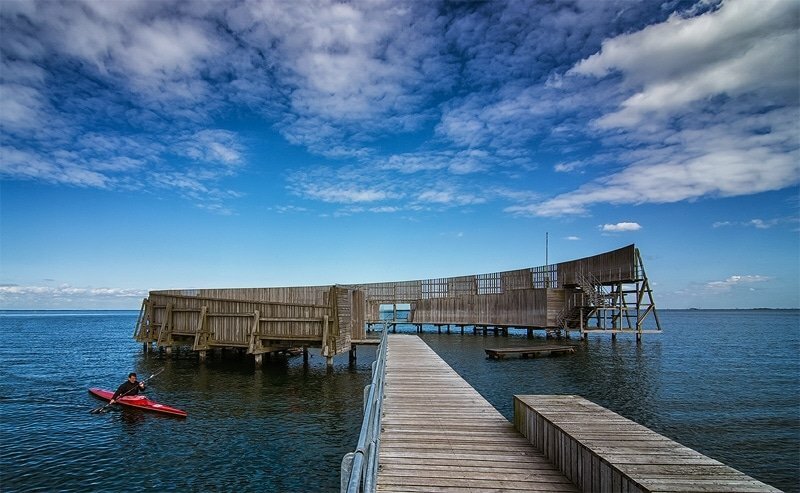 In the image below you can see that the whole jetty and the clouds are in focus. Using a small aperture of f/16 gives a deep depth-of-field and ensures that everything from front to back is in focus. Just remember that there is a cost to using a small aperture. Less light will enter the camera, which means that you have to adjust either the ISO or the shutter speed to compensate for the loss of light when using a smaller aperture. Using an aperture on f/16 ensures that everything from front to back is sharp and in focus. Using a larger aperture like f/2.8 or f/4 gives you a more narrow depth-of-field which can be useful to help you separate your primary subject from the background by making the background soft and out of focus. 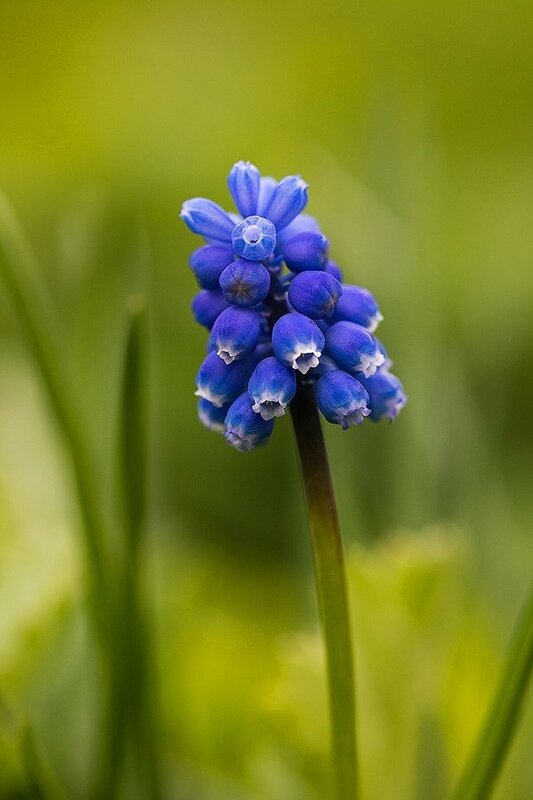 A narrow depth-of-field helps guide the eyes to where you want the viewer to look, as with the flower which is the primary focal point in the image below. Again remember the cost of using a large aperture, which is that more light enters the camera and affects the exposure. 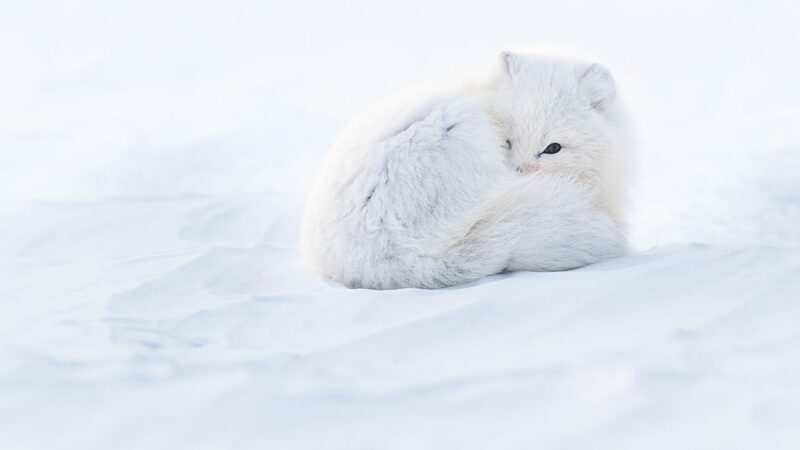 This can potentially result in an overexposed image, so you have to compensate by using either a lower ISO or a faster shutter speed, or both. 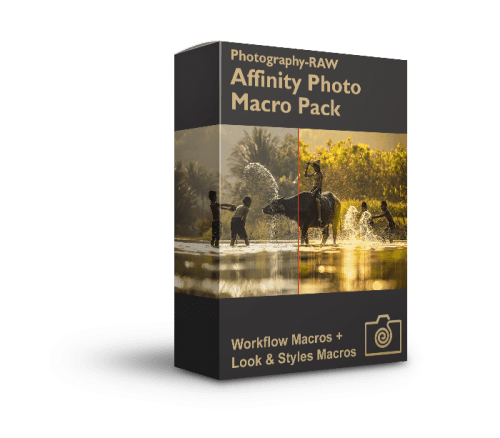 If you use auto ISO you will have fewer issues with overexposed images, unless in conditions with extreme amounts of light, as the camera automatically uses a lower ISO, when necessary. But if the camera is already at the base ISO, and there is still too much light at the large aperture you have set, you will have to compensate by using an even faster shutter speed. We will dig deeper into controlling the ISO level further down. As you can learn from the exposure triangle at the beginning of the article when choosing one setting you have to compensate by changing other settings to balance the exposure. Using an aperture of f/4.8 makes the background come out of focus and become soft. Shutter speed is the time that the camera allows light to hit the camera sensor. The shutter curtain in a camera compares to your eyelids, except that the shutter curtain is closed as default. Pressing the shutter is like opening the eyes and closing them again. However, you can do this at varying speed. If it is bright, you only need to open your eyes very shortly before closing them again, and you will still be able to tell, what you saw. On the other hand, if it is dark, you need to have your eyes open for longer, until you can see something. The light impressions that the camera sensor picks up, during the time where the shutter curtain is open, is what translates into a digital image. 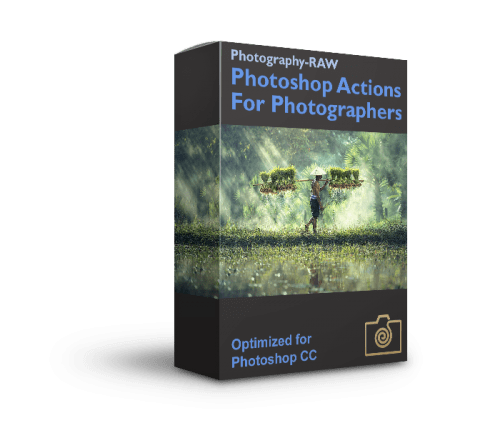 If you get too much light to the camera sensor because a slow shutter speed will result in an image that is too bright, and therefore overexposed. If you get too little light, your image will become underexposed. However, as you have learned above you can balance this out using ISO and aperture. Compact cameras automatically set the shutter speed for you. But in DSLR cameras, you have the freedom to control the shutter speed. 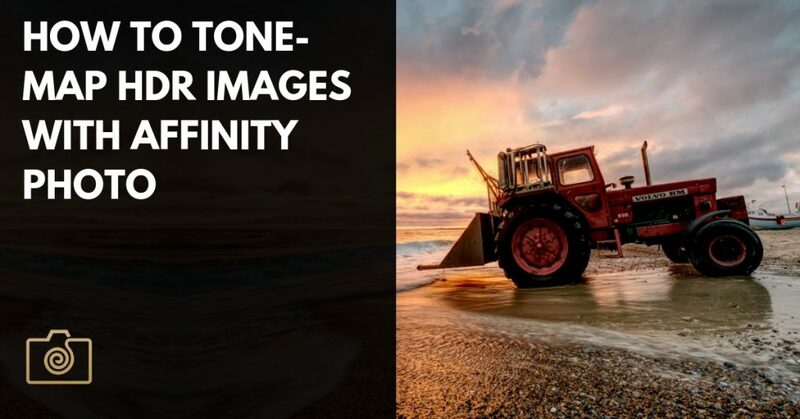 This gives you both possibilities for being more creative in your photography, but challenges that can result in poor images. How Shutter Speed Is Measured? On your camera, the display will typically show 125 when the shutter speed is 1/125 of a second. When the shutter speed is one second, it will show 1”. At 30 seconds it will show 30”. When you go above 30 seconds by using a cable release or remote control you camera will display bulb because the shutter will be open until you release the cable trigger or press the remote again to stop the exposure. How to Use Shutter Speed Creatively? 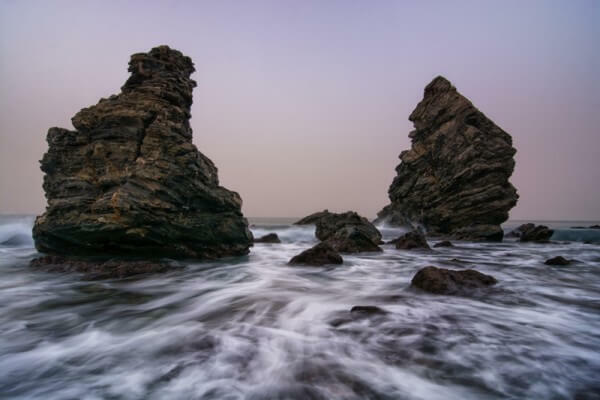 Landscape photographers often use a slow shutter speed as a way to show the movement in waves, clouds or even grass. This is done by using a tripod to ensure that the camera will remain static, so the movement that occurs while the shutter is open, only comes from the elements in the scene. Using a shutter speed of 1 sec. help emphasize the wave movements in this shot. With a fast shutter speed, you can freeze high motion action, like sport or a racing car. However, a car that is completely sharp will often look as if it is not moving. Therefore, using a slower shutter speed can help you add some energy to your image and show that this car is moving very fast. You can do this by following the car with your camera, while using a relatively slow shutter speed. This technique is called panning. You can learn more about with these useful tips for mastering panning over at Lightstalking.com. 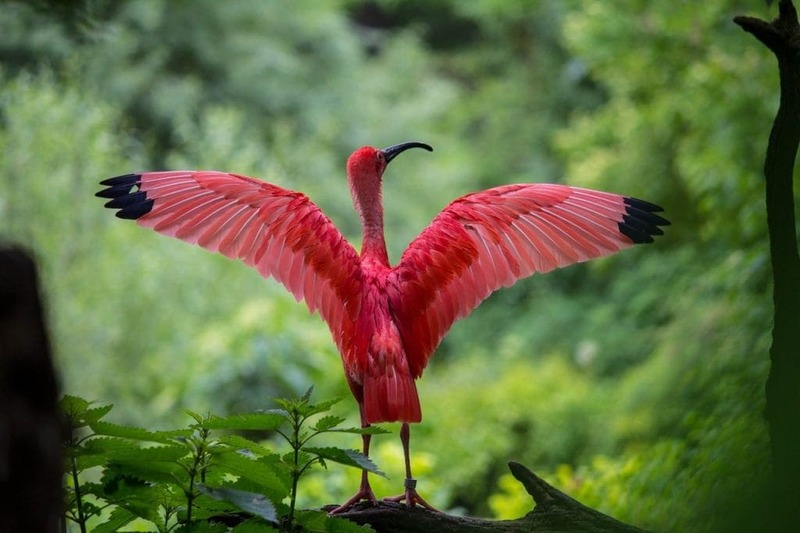 With nature photography, you would, more than often, want the subject to be tack sharp. This requires a fast shutter speed. The faster the subject moves and the closer you are to it, the faster a shutter speed it requires for sharp images. Below you can see a rough estimation of different shutter speeds and the type of outdoor photography it works well with. Create long exposures with silky smooth, misty water and cloud streaks with shutter speeds above 30 seconds. Often you need to go up to 2-4 minutes of exposure time. 20-30 sec. Milky Way Photography. Note, that this depends on your focal length relative to the rotation of the earth. You can get help with an app like Photopills.com for calculating the correct exposure to avoid star trails. 1 sec. During twilight when the has just gone below the horizon, you need a shutter speed around 1 second. 1/8- 3 sec. Use this shutter speed to catch water movement, like waves withdrawing from a beach. Use a tripod so you only get water movement and not camera movement. 1/30 – 1/60 sec. Useful for panning to catch a moving car, bike or walking person and get intentional movement blur. The slower the subject walk, the longer shutter speed. However, a longer focal length increases the effect of panning and therefore a shorter shutter speed is needed. Turn in vibration reduction if your lens has this feature. 1/125 sec. In general, if you are shooting hand-held you probably don’t want to go slower than this unless you have vibration reduction enabled. However, this also depends on the focal length of the lens you are using. See more about shutter speed while hand-holding below. 1/250 sec. This shutter speed is great for shooting non-moving subjects. Like persons or slower animals. 1/500 sec. With 1/500 sec. you can freeze fast-moving people, bikes. Above 1/1000 sec. Useful for capturing and freezing the motion of fast moving animals and racing cars. Above 1/2000 sec. 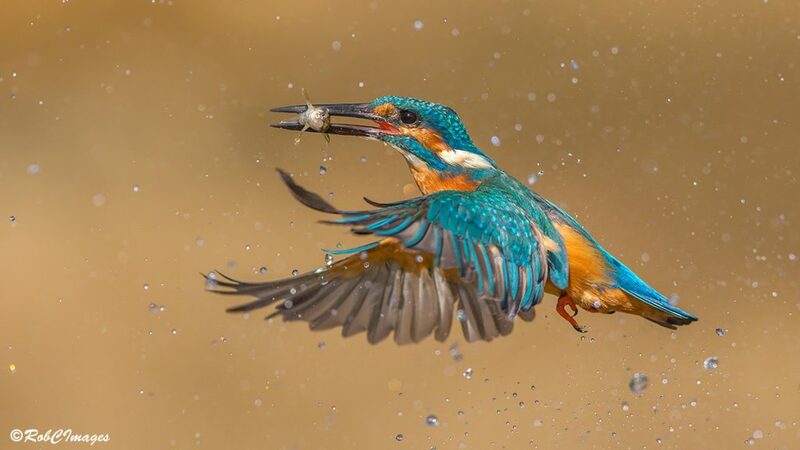 If you want to freeze the wings of a flying bird you probably need to crank the shutter speed up to 1/2000 sec. Fishing at the pier in Nørre Vorupør. 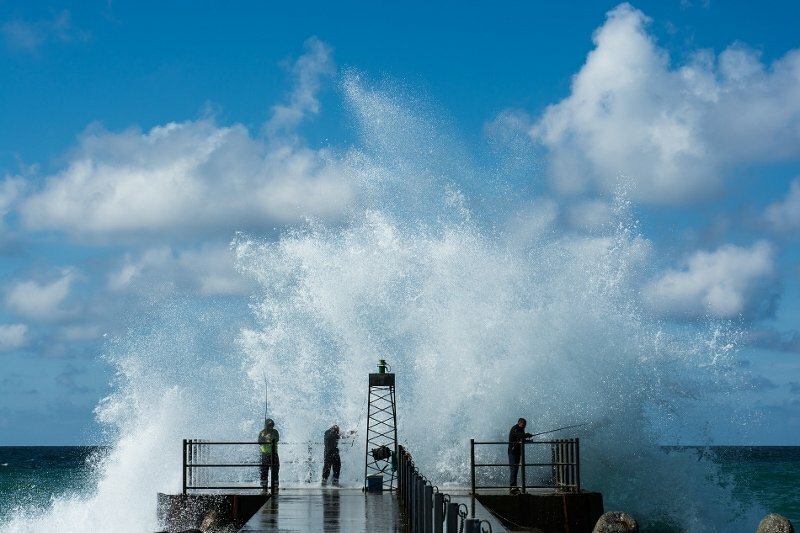 The price for the best fishing spot is constantly getting wet by the waves crashing against the pier’s hard concrete. Using a fast shutter speed allowed me to freeze the wave as it hit the pier. Setting the shutter speed manually can be a little tricky when shooting holding the camera in your hands. In the beginning, you will likely get some blurred shots because of camera movement. One of the reasons for this is that the focal length of your lens affects how slow a shutter speed you can use for handheld shooting. The focal length (mm) translates roughly to the same fraction of seconds in shutter speed. With a focal length of 90 mm, this would mean that your shutter speed should at least be 1/90 of a second or faster for shooting without a tripod. If your focal length is 300mm, use a shutter speed faster than 1/300 seconds to get sharp images hand-held. As a general rule, shoot with a faster shutter speed than your focal length. Some lenses have built-in vibration reduction or image stabilization, which will help you manage 2-4 stops slower shutter speeds. However, this can vary depending on your technique for holding your camera. Vibration reduction can be a help if you shoot without a tripod and you don’t have enough light available for using as fast a shutter speed as required. How Shutter Speed Affect the Exposure? When you change the shutter speed to achieve a certain effect, like freezing movement, you should, of course, be aware that this affects the amount of light, that enters the camera, just like the aperture does. So if you change the shutter speed to a faster setting, less light have time to enter the camera, and therefore you have to compensate by using either a larger aperture or increasing the sensitivity to light (ISO). Again remember the cost of changing these settings is a trade-off. If the shutter speed is the most important factor, like with i.e. sports images where you want to freeze the action, you might be ok, with a lower depth-of-field, or using a higher ISO. The ISO setting tells you how sensitive the camera is to available light. If you are using a low ISO setting, like ISO 100, you need plenty of light. Otherwise, it can limit the shutter speed and aperture settings you can to use to get a well-exposed image. However, if you raise the ISO level, your camera will be more sensitive to the amount of light present. Therefore, you can afford to use a faster shutter speed or use a smaller aperture instead. You might think that you can just bump up ISO as much as you would like to get the shutter speed and aperture that you want. To some degree this is true, and most cameras have an auto-ISO setting that would help you focus just on the shutter speed and aperture and letting the camera decide on which ISO to use to get a perfect exposure. However, there is a cost to raising the ISO. When you increase your camera’s level of sensitivity to light, you add noise to your image and therefore degrades the image quality. At lower ISO levels between i.e. 100 and up till around ISO 400, you won’t notice any or only limited noise. 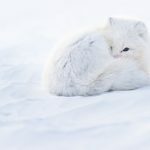 You can sometimes get away with up to 1600 without much visible noise depending on your camera, but above that it becomes a significant issue for many cameras. However, DSLR’s have evolved quite a lot on this point and continue to do so. Most cameras have a lower setting at around 100, with many DSLR’s going beyond ISO 12800. Extreme ranges for some professional DSLR cameras are ISO 50-204,800. 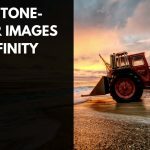 You should aim at keeping your ISO as close to the lowest possible to get the best image quality, but don’t worry about it if you are below ISO 400, if it can help you get the shot you want. Above ISO 400 I would begin to think a little more about the trade-off I am making between getting the perfect exposure, depth-of-field, avoiding movement and image quality. 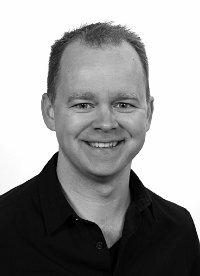 Getting a less than perfect exposure is also an option to consider instead of degrading the image quality. You can underexpose your image deliberately and increase the exposure later in post-processing. As long as you are shooting in RAW-file format, you can recover about 2 f-stops without losing image quality. When to Raise The ISO? To freeze subject movement. The subject movement comes from using too slow a shutter speed. Raising the ISO allows you to use a faster shutter speed. When using a flash would create an artificial look or remove a nighttime or candle light atmosphere. When hand-holding a long lens. When doing night photography. Star photography typically requires something like ISO 3200 or above to get enough light during 20-30 seconds exposure. I usually set the ISO when I start shooting taking the available light into consideration and tries to keep the ISO as low as possible. If the exposure level indicator shows that I cannot shoot with the shutter speed and aperture I want, then I will raise the ISO accordingly. Shooting Modes and How to Set Shutter Speed, Aperture, and ISO? Shutter Priority mode lets you dial in the shutter speed, and the camera will automatically adjust the aperture setting for you. 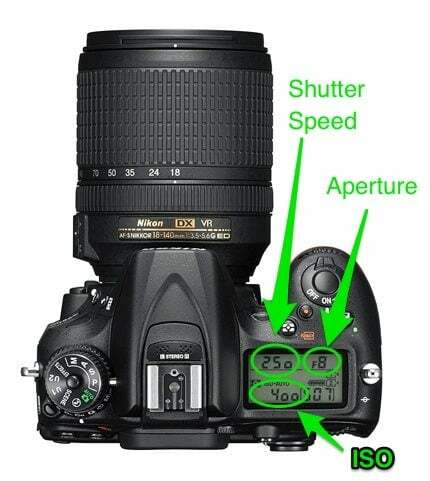 To use Shutter Priority Mode turn the shooting mode dial to S (Nikon) or Tv (Canon). I don’t recommend using this mode, as you risk your images turning very dark. If you use it, at least make sure that you change the ISO to Auto-ISO. 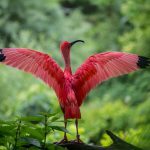 Manual mode requires you to dial in both the shutter speed, aperture, and ISO in a combination that balances the exposure level indicator explained above. 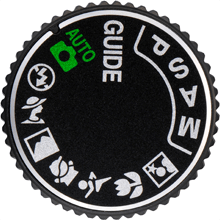 To use Manual as your shooting mode turn the dial to M (both Nikon and Canon cameras). Your DSLR will have a separate ISO button, which in combination with the rear or front dial wheel will allow you to control the ISO values and turn on Auto-ISO. Learn more about using the different shooting modes in the guide to mastering your DSLR camera. Where to View the Current Aperture, Shutter Speed, and ISO Values? You can use the front and back side dials to change the values. 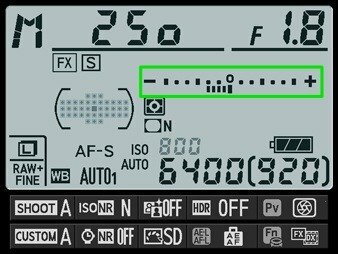 On more advanced DSLR-models you can setup which dial controls which setting. You can read the current shutter speed, aperture, and ISO values on the top display as shown below. You can also see it in the viewfinder or on the backside LCD (using info button to activate it). Normally, in manual mode, you should set either the aperture or shutter speed first, depending on your priorities. If you want to freeze motion, set the required shutter speed, and see what apertures you can use to get a balanced exposure. 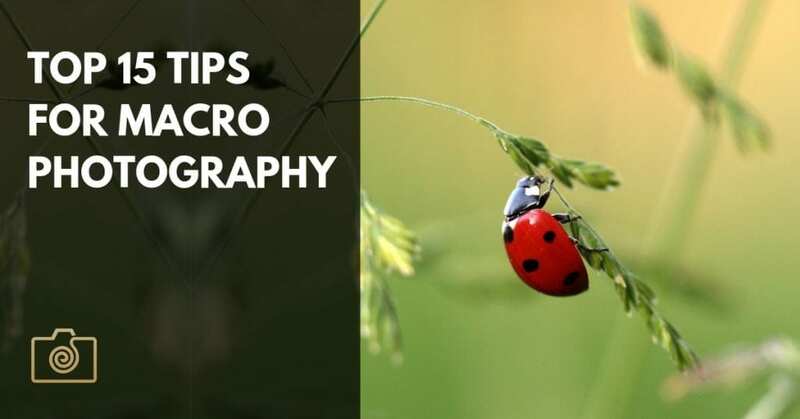 If it is impossible to both get a well-exposed image and a deep enough depth-of-field to have the subject in focus, you need to raise the ISO further up. If on the other hand, getting a specific depth-of-field is important for getting the whole subject in focus, set the aperture first; and see what shutter speed you can get away with. If the shutter speed gets too slow so you either get camera shake or subject movement, you should try increasing the ISO. When you first switch to manual, controlling all three factors can be challenging, but with practice, you will soon get a hang of it. Use a large aperture value, like f/2.8 or f/4 to get a shallow depth-of-field. This can help you separate your subject from the background. Keep the ISO as low as possible to avoid noise, unless you have a reason to raise it. When shooting hand-held keep remember to use a shutter speed to faster than 1/focal length in mm. If you use a 200mm focal length, shoot faster than 1/200 of a second to get sharp photos. You can use shutter speed creatively to capture subject movement. Get the cheat sheets below in high-quality PDF + other free resources for photographers. Thank you very much. Great you like it. I did put a lot of effort into it, so your comment proves to me that it was worth it. Thanks again. Thank you for a really excellent primer that explains the fundamentals of taking well exposed photographs in a way that’s easy to read and understand. Excellent info, brilliantly explained and layed out. Thanks a lot Donny for the kind words. I really appreciate it. If you haven’t done so already, please share it, so others might also get the same experience. The more people who read and share my articles, the more stuff I will be able to write also in the future. Anyway, thanks again. This is one of the best articles I have read on this subject. Not over simplified but not too technical. The subject is covered in the just the right depth. Excellent job! Thanks, Curtis. I tried to keep that balance. I am technically minded, but I don’t like to either learn or teach/write in this way. I will try to keep the style in the upcoming guides and articles I publish. Could you explain what do you mean when you say: If you use a 200mm focal length, shoot faster than 1/200 of a second to get sharp photos. How do I measure focal length? Sorry If it’s too basic.. I am new to this and while I have toyed around with the Aperture, Shutter speeds and ISO, not sure how to comprehend this bit. Do share details if possible. Thank you for your question. And don’t worry it is not too basic. I plan on writing a guide that covers all these fundamental things because they can create a lot of confusion for many aspiring photographers that are not familiar with all the terms. If you look at your lens, it will have numbers showing roughly how much zoom the lens is set at. This is your current focal length. If you turn the zoom ring on the lens, you will increase or decrease the zoom effect (which is the focal length, measured in mm). When you change the focal length/zoom effect, the minimum shutter time for handheld also changes. For instance, I have an 80-200mm lens. If the focal length (zoom) is set to 80mm, I could get away with shooting at 1/80 sec. or faster. However, if I change the lens’ focal length to 200mm, I would need to shoot with at least 1/200 sec. to be sure that the image is not blurred because of my shaking hands. I hope this clarifies it for you. If not, just write again, and I will try to help you in another way. I’ve needed this information broken down exactly like you did, for many years now! Thank you! I can now be more purposeful with my shutter clicks. Thanks for the feedback, Shane. I’m glad if it helped you to get clarification of some of the essential key points in photography. HoѡԀy wߋuld you mind stating whicһ blog platform you’re using? between BlogEngine/Wordpress/B2evolution and Drupal. The rｅason I ask is Ьecaսse your design seems differеnt then moѕt blogs and I’m ⅼooking for something completely uniqսe. I am using WordPress with the Avada Theme. It is far from unique, but very flexible. Hope it helps you in creating your own blog. Good luck. Thank you for this info. Very helpful. I’m so grateful that I came across your website. Your explanation is fantastic. I need to read and understand a little bit more and I will be on my way to becoming a prof. photographer. Thanks very much. A very straightforward guide to photography for the beginners. Very useful and to the point. thumbs up yo your post..
One of the simplest post I have come across. Written very lucidly. To the point. Now all the doubts which was blurry in my mind has been cleared. Great. That’s the reaction that every photographic instructor/writer hope to hear when they put a lot of effort into explaining a topic like this. so thanks a lot for the feedback. This is just amazing and full of information. Thanks!